Are you building a new fireplace or updating your existing design? Want to save thousands verses a custom-built unit? 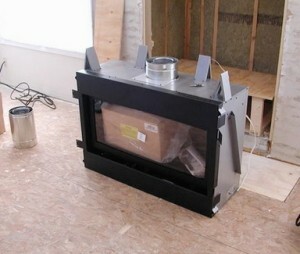 Then a builder’s box (built-in) fireplace insert could be your solution. What Is A “Builders Box” Fireplace? 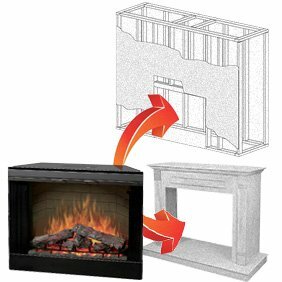 Builders box fireplace inserts are self-contained fireplace units designed to be installed into an existing fireplace opening by a trained installer or by a skilled do-it-yourself home owner. Most units are electric or natural gas. Many are ventless and can be operated with or without heat, allowing you to enjoy them all year long. There are dozens of builders box fireplaces on the market today. They are mostly sold via online vendors like Amazon.com and in most home supply stores (Home Depot, Lowes). Priced in-between a standalone fireplace insert and a custom-made or build-to-order manufactured fireplace, builder’s box inserts cost from $250 for a small electric unit up to more than $1,000 for a high-end modern ventless unit with artificial flame effects. Aside from what you would look for in any fireplace insert, the additional feature to look for in a builder’s box includes the ability to do a turnkey installation. 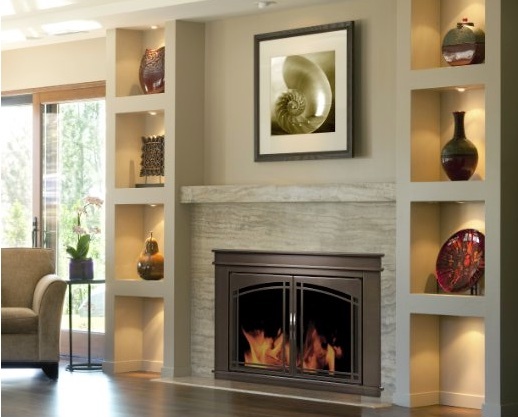 The unit should come with all parts, installation frames, trim pieces and gas/electrical connections so that installation into an existing fireplace mantle or opening is easy. Remember, you may be paying a professional installer to install your firebox, and time is money. Using our rating system, we’ve selected the following 5 builder’s box inserts as our top picks this year. We’ve selected inserts for electric, wood burning and gas installations, in several sizes. If you want the benefits of a fireplace without the hassles associated with traditional log fireplaces, then this is the unit for you. This popular Classic Flame model offers a variety of installation options, allowing for different styles. The fact that you can operate it with or without heat also makes it ideal for use throughout the year. With its traditional log design and black matte finish, the Classic Flame 36EB110-GRT matches most home decors as well as offers a source of heat for average sized rooms, when the weather turns cold. 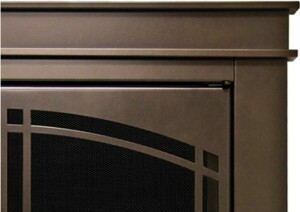 The all-black matte finish gives the fireplace a very attractive look. Combine this with the realistic looking flame and you have a fireplace that adds to any room’s style and décor. The product comes with a 3-prong plug that can be plugged into a 120V 3-Prong wall socket. Alternatively, the fireplace can be hardwired, although you will need the services of a professional electrician to do it. An integrated junction box is included along with the unit for those who choose to hardwire. LED indicators found on the fireplace insert display a digital thermostat that lets you control the amount of heat emitted; an electric timer for automatic shut off (you can set the timer anywhere between 5 minutes and 9 hours); a power-on indicator, and five brightness settings. • A maximum of 4600 BTU heat output at 1400 Watts. • Measurements: 36 inches D x 24 inches H x 7.62 inches Thick. • Highly realistic flame technology provides one of the best natural flame effects in the business. • A multifunction remote control is included with the unit. With it, you can control functions such as brightness, heat and timer. Generally, most customers are pleased with their purchase and rate the product 5 stars. One of the most common complaints among customers is that the heat is not enough for a large room. The heating feature works best in an average sized room. If you are planning to buy it primarily as a source of heat for a large room, you may want to rethink your options. The Classic Flame Builders Box Traditional 36EB110-GRT is a classy, efficient and beautiful fireplace insert. Classic Flame is known for their realistic flame effects, and this one really delivers whether you want heat or not. Everything from appearance to function and ease of use scores highly. This unit is an excellent choice for anyone looking for a traditional-looking alternative to more complicated and energy-sapping fireplaces. Not many fireplaces are able to achieve a sleek modern look like this fireplace insert does for anywhere close to the price. 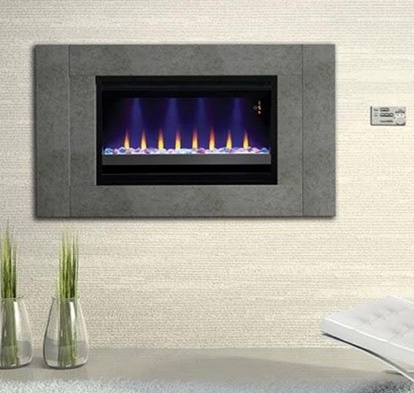 The 220V 36″ Builders Box Contemporary 36EB221-GRC will transform any room with its modern finish and unique flame and lighting features. The black outer finish gives this builder’s box a great modern look. It is ideal for homes where a modern look is required. A flange is provided surrounding the insert to allow for easy flush installation with a wall. Installation is easy, though you may need help from an electrician with the hard wiring. An integrated junction box is available for that purpose. You may not always want heat from a fireplace ruining up an already hot summer evening. Whenever you want to enjoy the sight of the fireplace without the heat, you can simply turn it off. When the leaves start to fall again, turn the heat back on to create a warm cozy space. You can set the fireplace to shut itself off after a specified amount of time using the electronic timer. You can set it to run from 30 minutes up to 9 hours. One of the best features of the Builders Box Contemporary 36EB221-GRC is the combined effect of the down-lights and up-lights. Have fun playing with the nine color options, seeing which color combinations work best for your room. You can change each set of colors independently, for example when guests are coming over for a party. One customer suggested setting the color to blue for both up-light and down-lights to create an amazing aquarium effect (see image). • 36 inches wide x 24 inches high x 7.62 inches deep. • A maximum heat output of 8900 BTU at 220V. This means that the fireplace can easily warm up a large room. The manufacturer recommends it for any room measuring up to 800 square feet (20ft x 40 ft). • You can choose which media to have in the fireplace. Options available include crushed glass or white and clear rocks. • LED indicators on the unit. Great heater. Pretty and fun alternative to traditional fire look. Easy install. This unit must be hard wired, which usually requires using a professional electrician. There is no 3-prong plug for plugging into a 110V outlet. 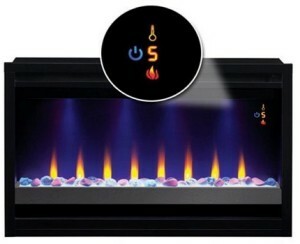 Overall, the is one of the best contemporary fireplace inserts you will find anywhere for anything close to this price. With its sleek style, high maximum heat output and so many settings variations, this Classic Flame builders box unit will work in almost any modern room setting. Whether you want to cozy up in your living room, install it in your bedroom or even in your entertainment center, you will not be disappointed. One thing you immediately notice about AKDY fireplace units is how realistic they look. You can even see soot on the fake logs. The flame looks very authentic. It recreates the same cozy effect of a real wood fireplace while at the same time providing a substantial amount of heat for most sized rooms. The matte black finish of the insert adds to its authenticity. It is bound to look good wherever you install it. 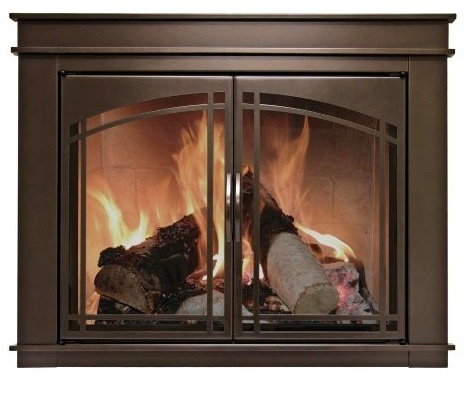 The flat panel glass gives it a classy look that balances the traditional feel of the fake logs and flame. 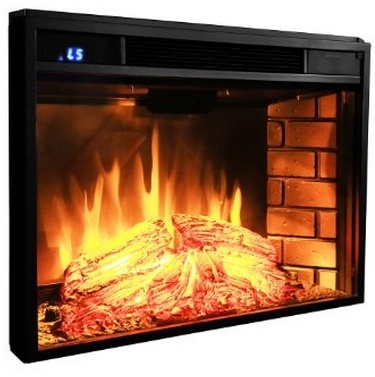 All you need to enjoy this electric fireplace heater is an existing fireplace opening. You simply insert it into the recessed space, plug it in into a 120V plug and you are good to go. If there is no fireplace, you can get a small cabinet made for the insert. Add a few books to the side shelves of the cabinet to enhance that cozy feeling. The maximum heat output of this model is 4436 BTU. This is enough to warm up a room measuring up to 400 square feet. • A width of 28 inches, height 20 inches and depth 11.5 inches. • Variable heat settings. You can change the heat within the six levels available. • A multi-function remote control included. • Unlike many models, this unit operates very quietly. You won’t even notice the soft sound, which makes it great for bedrooms and places where you watch TV or listen to music. • You can use it with and without the heat function. You don’t have to turn off its beautiful effect when summer arrives, simply turn down the heat or turn it off completely. • A unique brick panel inside that makes the fireplace look almost real and tastefully traditional. It is quiet, looks great, and gives you more heat for the price point. A common concern among customers is the remote control, which some say is a bit low quality and fails to function at times. This AKDY unit lives up to the hype it gets in customer reviews. Some prefer it over comparable Dimplex units. Until you buy it and install it in a room, you won’t believe how much of a difference it can make. 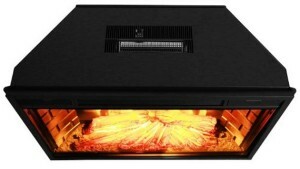 It also proves important in winter and at night when you need a little more heat for your room. For those who don’t find the heat output or appearance of electric fireplaces inserts enough, this is a great natural gas fireplace insert. This is a dual-fuel firebox, meaning that it can use either propane or natural gas. A big advantage of natural gas units is that they produce a lot more heat than electric inserts. Like most electric inserts, this unit is ventless, which means it can be installed in almost any setting. 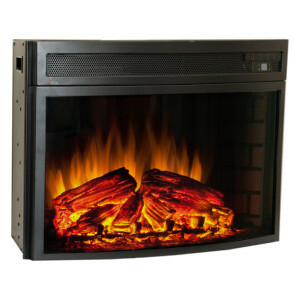 Many customers praised the easy and quick installation of the 32″ Dual Fuel Firebox and Log Combo. The manual is easy to follow, and all accessories required during installation come with the unit. If you have a recess ready, you won’t need to call a professional installer ($100/hour and up). Keep this in mind when comparing this unit against competing, cheaper units that require an installer. A remote, which comes with the unit, can be used to control the heat output of the unit. You can set what room temperature you are comfortable with. The remote also has an on/off function. Electric inserts range between 4600 and 9000 BTUs in terms of heat output. 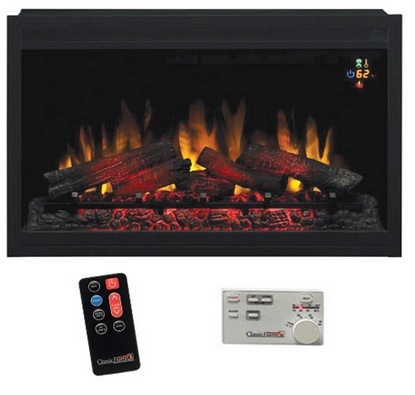 The 32″ Dual Fuel Firebox and Log Combo fireplace goes way above this to deliver a maximum heat output of 32,000 BTU. This will heat up a very large room in no time. • Dimensions: 36.4 inches width, 33.3 inches height and 18.4 inches depth. • A 24 inches 9 log set is included. 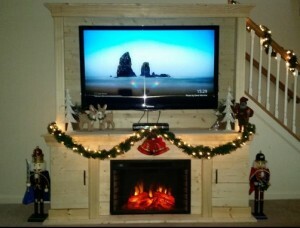 • You can either install the fireplace in a wall recess or customize it with a mantel. The firebox/log combo set was everything I expected. It is well made and arrived on time and in excellent condition. A common concern among customers is the lack of an electronic ignition. The pilot light is slightly annoying, but most people get used to it after a short time. If you need to use your fireplace as a primary source of heat, then you should seriously consider this unit. 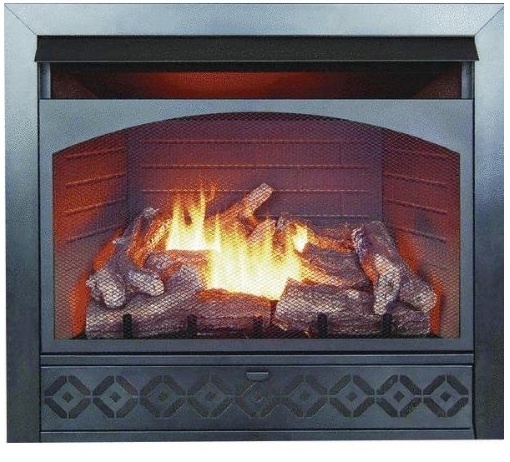 The 32″ Dual Fuel Firebox and Log Combo fireplace is worth its price. It delivers on every front including heat output, appearance and ease of use. This fireplace is as traditional as it can get. For one, it is a wood-burning fireplace. Second, its appearance (dark finish and oil rubbed bronze) is very high quality. It provides an antique look that works well for traditional decor, but also in modern settings (see image below). If you want nothing but the real thing, then this is the fireplace insert to go for. It requires some work installing, but it’s a great deal for such a high quality product. The first thing you will notice is the classic dark finish on the exterior. The oil rubbed bronze finish blends well with any masonry fireplace. Add to that, the prairie style glass doors and you have a very unique and beautiful fireplace. Also included with the unit is a safety smoked tempered glass and high quality rigid mesh panels. The manufacturer says this is one of the easiest fireplace inserts to install. In three easy steps, you are good to go. The premium hinges and easy catch magnets also make swinging the doors open/shut a breeze. The style of this wood-burning fireplace insert works in both traditional and modern settings (see image). The combined effect of the prairie doors, the dark bronze finish and the brick face makes it an easy choice for most living room and bedroom styles. This is the fireplace most people expect to see. The glass doors are important in ensuring that heat does not escape from your house through the chimney when you are not using the fireplace. This fireplace is not the lightest. Its heavy feel is due to the strong and sturdy materials used. This makes it durable and ideal for a wood-burning masonry fireplace. • A two inch riser bar is included in the unit but not assembled into it. You can opt to install it in the unit or leave it out. • The manufacturer cautions that this insert is only for use in masonry fireplaces and not prefabricated ones. • When fully assembled, the unit measures 37.5 inches in width, 30 inches in height and 1.5 inches in depth. Very solid and beautiful doors! Though installation is easy, it can be a bit tricky. Some customers recommend that you watch Youtube videos to get an idea of how to go about it. The manual that comes along with the unit has easy to understand instructions. If you are looking for a fireplace that will heat up a large room and offer true wood-burning flames, the Pleasant Hearth Fenwick is a our top choice. Not only will it cozy up your house, it will become the central focal point of your room’s decor.